Barley is an important cereal crop cultivated for malt and ruminant feed and in certain regions it is used for human consumption. It is vulnerable to numerous foliar diseases including barley leaf rust caused by the pathogen Puccinia hordei. A temporarily designated resistance locus RphCantala (RphC) identified in the Australian Hordeum vulgare L. cultivar ‘Cantala’ displayed an intermediate to low infection type (“;12 = N”) against the P. hordei pathotype 253P- (virulent on Rph1, Rph2, Rph4, Rph6, Rph8 and RphQ). Phenotypic assessment of a ‘CI 9214’ (susceptible) x ‘Stirling’ (RphC) (CI 9214/Stirling) doubled haploid (DH) population at the seedling stage using P. hordei pathotype 253P-, confirmed that RphC was monogenically inherited. Marker-trait association analysis of RphC in the CI 9214/Stirling DH population using 4,500 DArT-seq markers identified a highly significant (−log10Pvalue > 17) single peak on the long arm of chromosome 5H (5HL). Further tests of allelism determined that RphC was genetically independent of Rph3, Rph7, Rph11, Rph13 and Rph14, and was an allele of Rph12 (Rph9.z), which also maps to 5HL. Multipathotype tests and subsequent pedigree analysis determined that 14 related Australian barley varieties (including ‘Stirling’ and ‘Cantala’) carry RphC and that the likely source of this resistance is via a Czechoslovakian landrace LV-Kvasice-NA-Morave transferred through common ancestral cultivars ‘Hanna’ and ‘Abed Binder’. RphC is an allele of Rph12 (Rph9.z) and is therefore designated Rph9.am. Bioinformatic analysis using sequence arrays from DArT-seq markers in linkage disequilibrium with Rph9.am identified possible candidates for further gene cloning efforts and marker development at the Rph9/Rph12/Rph9.am locus. Leaf rust, caused by Puccinia hordei, is one of the most destructive foliar diseases of barley, and has caused significant yield losses in many regions where barley is grown -. Yield reductions of up to 32% have been reported in certain susceptible barley cultivars in both Australia and North America . Due to potentially adverse environmental effects of fungicides, the most preferable and cost-effective means of controlling barley leaf rust is through the development and deployment of durable host resistance . In cereals, two major types of resistance have been described for rust pathogens, seedling resistance and adult plant resistance (APR). Seedling resistance genes are effective at all stages of crop development and are often characterized by a hypersensitive response. Numerous genes conferring seedling resistance to P. hordei (Rph) have been identified (Rph1-Rph19 , Rph21-Rph22 ,), however, virulence matching most of these genes has been detected . In some regions, including South Australia, the presence of the alternate host Ornithogalum umbellatum (‘Star of Bethlehem’) can permit sexual recombination and increase the likelihood of new virulent pathotypes developing -. New sources of seedling resistance are required for use in breeding programs in combination with APR for durable protection against P. hordei. Furthermore, for effective deployment within breeding programs, it is equally important to understand the mechanisms of inheritance and pathotype specificity of newly identified resistance genes. Previous studies on the inheritance of seedling resistance to P. hordei have determined that many of the known Rph loci are complex. From a total of 23 catalogued Rph genes, three have been previously reported to be alleles of other genes. Rph5 is allelic to Rph6 , Rph12 is allelic to Rph9  and Rph15 is allelic to Rph16 . In the case of Rph9 and Rph12, a large F2 population of 3,858 progeny derived from ‘HOR 2596’ (Rph9) x ‘Triumph’ (Rph12) was evaluated and no recombinants were detected, suggesting that both are alleles of the same gene . Rph9 and Rph12 also mapped to the same locus on chromosome 5H and were linked to a common molecular marker, ABC155. Previous studies have determined that the Australian cultivar ‘Cantala’ carries an uncharacterised seedling gene for resistance to P. hordei that was temporarily designated RphCantala (RphC) . Recent evidence suggests the RphC is present in several Australian and European barley cultivars and was originally derived from European descent. Although virulence for RphC is common among Australian populations of P. hordei, such resistance may be useful in combination with other resistance sources. This study reports on the characterization and genetic mapping of the RphC resistance. Data on both the physical location and possible candidate genes for the RphC resistance locus are presented and discussed. A doubled haploid (DH) population, CI 9214/Stirling, derived from ‘CI 9214’ (PI 186125) (postulated to carry Rph1; R. F. Park, unpublished) and ‘Stirling’ (PI 466919) (RphCantala; , R. F. Park, unpublished) with 258 progeny was used for genetic analysis in this study. F3 populations derived by intercrossing ‘Cantala’ (PI 483047) with ‘Estate’ (Rph3) (CI 3410), ‘Cebada Capa’ (CI 6193) (Rph7), ‘Clipper BC8’ (Rph10), ‘Triumph’ (Rph12) (PI 186125), and ‘PI 531849’ (Rph13) were used for tests of allelism. A total of five pathotypes of P. hordei used in the study along with their virulence/avirulence profiles and reactions to barley differential lines and Australian cultivars postulated to carry RphC are listed in Table 1. All pathotypes used originated from annual pathogenicity surveys of P. hordei conducted in Australia and are maintained in liquid nitrogen at the Plant Breeding Institute, University of Sydney. 1Plant Breeding Institute Cobbitty rust collection accession numbers. 2P- and P+ indicate avirulence and virulence, respectively, for Rph19. 3Culture kindly provided by Dr R.G. Rees, Queensland Department of Primary Industries. 4Original seed kindly supplied by Dr R.A. Pickering, New Zealand Institute for Crop and Food Research Limited. Sowing and inoculations were performed as described by Sandhu et al. . Disease response was assessed 12 days after inoculation using a modified “0” – “4” scale as described by McIntosh et al. . Variations of the infection types were indicated by the use of “-” (less than average for the class), ‘+’ (more than average for the class), ‘C’ (chlorosis), ‘N’ (necrosis) and “X” which denotes a mesothetic infection type with a mixture of infection types on the same leaf. A comma separating different infection types was used to indicate heterogeneity within a given test host genotype. When two different infection types were observed on a single leaf, they were written together without a comma. Genomic DNA was extracted from the leaf tissues of a single plant from a subset of 61 from the 258 original CI 9214/Stirling DH lines using CTAB essentially as described by Fulton et al. . The DNA of each DH line was diluted to 100 ngμL−1 and subjected to genotypic analysis using the DArT-seq platform essentially as described by Curtois et al. , except that the marker curation involved removing the markers with low minor allelic frequency (MAF) (i.e. < 0.1) and > 50% missing data. Genetic linkage maps were constructed using MSTMap software . The following specific parameters of MSTMap were used viz. name for the mapping population: DH; the distance function: Kosambi; the threshold to be used for clustering the markers into LGs: 0.000001; the objective function: COUNT. In addition, any group of markers less than two and with a distance of 15 centimorgans (cM) away from the rest of the markers was placed in a separate linkage group. This linkage map of the CI 9214/Stirling DH population was specifically constructed for genetic mapping of RphC, for this the phenotypic data of P. hordei pathotype 253P- was converted to binary data [(susceptible 3+ =0 or resistant i.e. ;12 = CN” =1) and was then included as an additional marker. The map positions (cM) of all closely linked DArT-seq markers to RphC on the CI 9214/Stirling genetic map were compared with the Bowman consensus map and the Hordeum vulgare L. cv. ‘Bowman’ genome assembly . Marker-trait analysis of each DArT marker with the RphC phenotype was conducted by computing Fisher’s exact test on 2 X 2 count tables using R statistical software (www.r-project.org). The null hypothesis was that the DArT marker genotypes were not associated with resistance to P. hordei; hence a random distribution of genotypes in the resistant and susceptible phenotypic groups. The –log10 of P values were plotted against the positions on the physical Bowman genome assembly  by means of chromosome-wise and genome-wide ‘Manhattan’ plots. Linkage disequilibrium (LD) r 2 was measured between the binary scores of the RphC phenotype (0, 1) with each DArT-seq marker genotype using GOLD . The correlation coefficient of each marker with RphC binary phenotypic score was plotted against the Bowman genome assembly by means of a genome-wide ‘Manhattan’ plot. The sequences of DArT-seq markers with r 2 > 0.8 were individually blasted (blastn) against the ‘Morex’ barley genome sequence browser (www.gramene.org) to identify the physical scaffold of genes in the region between markers flanking RphC based on relationships between the CI 9214/Stirling DH population genetic map and the 'Bowman' consensus genetic maps. The physical positions and annotations of all genes located between DArT-seq marker DART461 (504808312–504808380) and DART4872 (509749584–509749620) were tabulated to identify possible candidates for RphC. Further Pfam protein annotations were also assigned to the DArT-seq markers that were located within predicted genes in the ‘Morex’ genome. The haplotype blocks in the significant region were constructed using Haploview  to examine the LD in the region and among significant DArT-seq markers. The barley cultivar ‘Cantala’ contained an uncharacterised seedling resistance gene (RphC) to P. hordei that was identified through phenotypic assessment of the Australian barley differential lines (including ‘Cantala’) with a range of P. hordei pathotypes (Table 1). Multi-pathotyping tests on other barley cultivars suggested that that in addition to ‘Cantala’ , ‘Bandulla’ , ‘Bussell’ , ‘Chebec’ (with Rph19), ‘Hamelin’ , ‘Lara’ , ‘Milby’ , ‘Moondyne’ , ‘Noyep’ , ‘Parwan’ , ‘Research’ , ‘Resibee’ , ‘Tilga’ (heterogeneous) and ‘Stirling’ also carry RphC. None of these cultivars carried Rph12 (Table 1). The parental genotypes of the CI 9214/Stirling DH population were postulated to carry Rph1 and RphC based on the observed infection types (IT) in response to P. hordei pathotypes 200P- (avirulent for Rph1 and virulent for RphC) and 253P- (virulent for Rph1 and avirulent for RphC), respectively (Figure 1; Table 1). Pathotype 200P- was avirulent on ‘CI 9214’ (Rph1) and ‘Triumph’ (Rph12) and virulent on ‘Cantala’ (RphC). Conversely, pathotype 253P- was virulent on ‘CI 9214’ (Rph1) and avirulent on ‘Stirling’ (RphC), ‘Cantala’ (RphC) and ‘Triumph’ (Rph12). Both pathotypes were virulent on the universal susceptible line ‘Gus’ (Figure 1; Table 1). The CI 9214/Stirling population of 258 DH lines was phenotyped using pathotype 253P- and in response the resistant parent ‘Stirling’ gave the same IT “;12 = CN” as observed in the barley variety ‘Cantala’ with the same pathotype, whilst the susceptible parent ‘CI 9214’ gave IT “3+” to this pathotype. The observed segregation within the CI 9214/Stirling population fitted with a predicted single gene inheritance model 1:1 ratio using Chi squared analysis (121 resistant: 137 susceptible (P > 0.3)). Seedling leaves of the infection types of (L to R): (1) CI9214 ( P. hordei pathotype [pt] 253P-/Virulent Rph1 ) (2) CI9214 (pt 210P+/avr Rph1 ) (3) Stirling (pt 253P-/avr RphCantala ) (4) Cantala (pt 253P-/avr RphCantala ) (5) Cantala (pt 210P+/vir RphCantala ) (6) Triumph (pt 253P-/avr Rph12 ) (7) Gus (pt 253P-/vir) and (8) Gus (pt 210P+/vir). A total of 61 representative genotypes of the CI 9214/Stirling DH population from both resistant and susceptible phenotypic classes were selected for genetic mapping of RphC and subsequently genotyped using 10,258 DArT-seq marker loci. A genetic map was constructed and contained nine linkage groups spanning 4,246 cM using over 4,500 DArT-seq markers, which include the RphC binary phenotype as a marker. Based on the known positions of flanking markers on the consensus ‘Bowman’ , ‘Morex’ and ‘Barke’ genetic maps, RphC was mapped to chromosome 5HL between 129–134 cM (Figure 2). RphC co-segregated with two DArT markers (DART4872 and DART7508) and was 1.8 cM distal to the flanking markers DART2682, DART5867 and DART7413 and 3.9 cM proximal to DART6236 and DART214 (Figure 2). 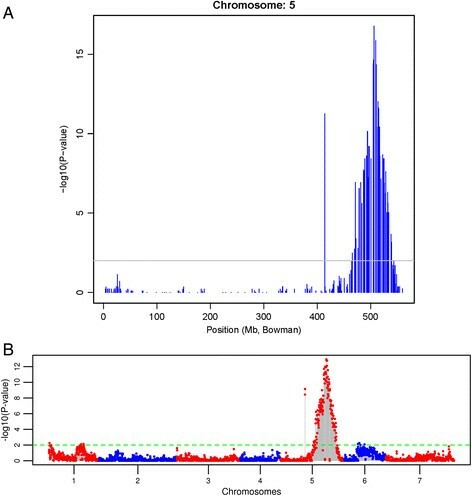 Further genome-wide marker-trait association demonstrated that DArT sequences only on 5HL were associated with RphC phenotypic scores indicated by two significant peaks [−log10(P-value) of 17.5], across the entire genome, at approximately 506 Mb on 5HL (Figures 3A and 3B) and correlated with LD mapping results of RphC (Additional file 1). Further linkage disequilibrium analysis identified that the 2nd peak at 430 Mb was due to incorrect map position of a single DArT marker (data not shown). Partial linkage maps of linkage group seven of nine of the CI9214/Stirling doubled haploid population encompassing leaf rust resistance gene RphCantala . 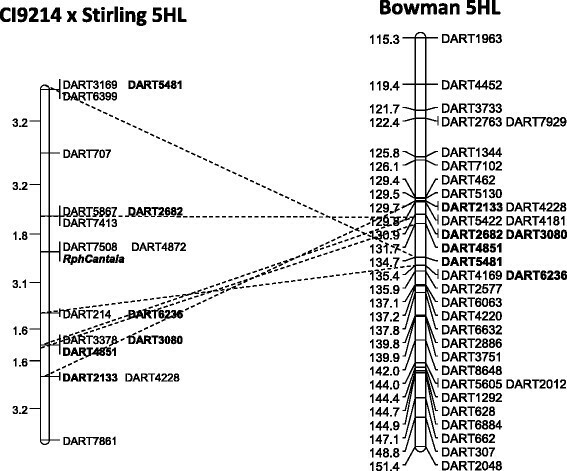 Comparative map analysis was performed using common DArT markers between the CI9214/Stirling and the 'Bowman' consensus DArT-seq genetic map. DArT markers in common are in bold. Marker trait association analysis scans using Fisher’s exact test Vertical axis represents -log10 (P) values of the P-value of the marker trait association. The peaks above minimum threshold of 2 (P-value = 0.03) can be considered as significantly associated. The colours blue and red were used to differentiate between chromosomes (1H-7H). (A) Chromosome-wise plot and (B) genome-wide manhattan plot of chromosome 5HL derived from marker-trait association (MTA) analysis using Fisher’s exact test on 2 X 2 count table for seedling resistance to Puccinia hordei pathotype 253P- (binary scoring data) in the CI9214/Stirling doubled haploid population using 4, 500 DArT-seq markers. The –log10 of P-values were plotted against the positions on the physical Bowman genome assembly . The peaks above minimum threshold of 2 (P-value = 0.03) can be considered as significantly associated. Tests of allelism between RphC and two previously identified Rph seedling genes on chromosome 5HL (Rph12 and Rph13) indicated that RphC is independent of Rph13 but completely linked with Rph12. A two-gene segregation (fitting 7Res: 8Seg: 1Sus model) was observed in F3 families involving crosses of RphC with Rph13 when tested with pathotype 253P- (Table 2). On other hand, there was no segregation among F3 families of cross involving RphC and Rph12 when tested with pathotype 253P- (avirulent for both RphC and Rph12). This suggests that RphC is an allele of Rph12 (Rph9.z) with distinct specificity and can therefore be given the allele designation Rph9.am. Two additional populations derived from ‘Estate’ (Rph3)/‘Cantala’ and ‘Cebada Capa’ (Rph7)/‘Cantala’ were also tested with pathotype 253P- and both populations conformed to expected two gene segregation model (Table 2). Maximum recombination r = 1.1 cM (P = 0.01) and r = 0.7 cM (P = 0.05) calculated from Hanson  based on the hypothesis that the two loci are different. #Chi squared values are denoted a and b for 2 and 1 degrees of freedom, respectively. Pedigree analysis was performed on all 14 Australian barley cultivars postulated to carry RphC including: ‘Bandulla’ , ‘Bussell’ , ‘Cantala’ , ‘Chebec’ , ‘Hamelin’ , ‘Lara’ , ‘Milby’ , ‘Moondyne’ , ‘Noyep’ , ‘Parwan’ , ‘Research’ , ‘Resibee’ , ‘Tilga’ (heterogeneous) and ‘Stirling’ using the online barley pedigree resource http://genbank.vurv.cz/barley/pedigree/. On this basis, cultivars ‘Gull’ and ‘Binder’ were predicted to be the sources of the RphC resistance in ‘Stirling’ , ‘Bandulla’ , ‘Noyep’ , ‘Lara’ , ‘Stirling’ , ‘Research’ , ‘Chebec’ , ‘Moondyne’ , ‘Bussell’ and ‘Cantala’. Pedigree analysis suggests that ‘Maja’ (pedigree of ‘Ymer’ and ‘Erectoides 16’) share common ancestry of ‘Binder’ and ‘Gull’ (Figure 4). Both ‘Gull’ and ‘Binder’ were derived from landraces from Sweden (‘LV-Gotland’) and ‘Czechoslovakia’ (LV-Kvasice-NA-Morave through ‘Hanna’), respectively (Figure 4). The donor sources of seedling resistance in ‘Hannan’ , ‘Milby’ and ‘Tilga’ could not be explained based on available pedigree information. Pedigree relationship of barley varieties ‘Stirling’ (PI 466919) and ‘Cantala’ (PI 483047/AUS 99074) (postulated to carry RphCantala based on multipathotype tests and genetic mapping analysis) tracing the RphC resistance back to Swedish and Czechoslovakian landraces LV-Gotland and LV-Kvasice-NA-Morave. ‘Cantala’ is derived from pedigrees ‘Kenia’ and ‘Erectoides 16’, a mutant derived from the Danish cultivar ‘Maja’. A total of 15 DArT-seq markers had an r 2 > 0.8 and five of these were in complete LD (r 2 = 1) with RphC (Table 3; Figure 3; Additional file 1). Table 4 provides a list of DArT locus name, clone ID and associated sequences for each marker. DArT-seq markers DART4872 and DART7508 that co-located with RphC in the CI 9214/Stirling genetic map were both in complete LD with RphC, however, they along with DART7846 were not present in the ‘Bowman’ consensus maps (Table 3; Figure 2). Furthermore, the sequence of the most closely associated DArT-seq marker based on the lowest Fisher's exact test P value to RphC (DArT4851) was located within a predicted disease resistance protein (NB-ARC) based on Pfam analysis (Table 3). Two other sequences (DART7846 and DART3079) were located within the same transcript of another predicted disease resistance gene (serine/threonine receptor kinase gene) on chromosome 5HL. In the ‘Morex’ genome both DART7846 and DART3079 had a closest match to a physical position 9520434–9520483 distant to all other closely associated DArT sequences, but the contig in the ‘Bowman’ assembly mapped to physical position 506583400 (Table 3). DArT locus names used throughout manuscript derived from clone ID/SNP variant and associated sequence read. Bioinformatic analysis of the interval containing DArT-seq markers with an r 2 value > 0.81 spanned 5 Mb in total and was gene-rich with 75 genes (>60% uncharacterized) (Table 5). The haplotype block analysis using significant DArT-seq markers showed very high linkage disequilibrium among these markers (data not shown). From the 75 predicted transcripts within this region, there was also a relatively large representation of various transcription factors, while only three predicted disease resistance proteins were identified including NB-ARC, NBS-LRR and a serine/threonine receptor kinase (Table 5). Here we report on the discovery and mapping (genetic and physical) of a new seedling resistance allele to P. hordei, previously temporarily designated as RphC. A previous genetic study using a large F2 population determined that the Rph12 resistance locus in ‘Triumph’ was an allele of Rph9  and was therefore re-designated as Rph9.z based on nomenclature described in Franckowiak et al. . Our studies demonstrated that RphC is an allele of Rph12 (Rph9.z) found in ‘Triumph’ based on tests of allelism, chromosomal location and pathotype specificity. Tests of allelism were performed in this study by intercrossing ‘Cantala’ with barley differential lines carrying Rph3, Rph7, Rph10, Rph12 and Rph13. RphC was independent from Rph3, Rph7, Rph10 and Rph13 based on observed segregation ratios conforming to two-gene prediction models. Further genetic analysis of F3 populations demonstrated that there was no segregation for resistance to P. hordei pathotype 253P- between ‘Cantala’ and ‘Triumph’ , suggesting that RphC and Rph12 are likely allelic and therefore RphC should be designated Rph9.am. Both multipathotype analysis and observed ITs between ‘Cantala’ , ‘Stirling’ and 13 other Australian barley cultivars postulated to carry Rph9.am suggest that the resistance mapped in this study is the same gene. Rph9.am had different specificity than Rph12 (Rph9.z). P. hordei pathotype 253P- was avirulent on Rph9.am and Rph12, however pathotypes 210P+ and 200P- were avirulent on Rph12 yet virulent on Rph9.am. Genetic analysis of the CI 9214/Stirling DH population using the 253P- pathotype conformed to a single gene inheritance contributed by the ‘Stirling’ parent. Further assessment of this population with P. hordei pts 243P+ (avirulent on Rph9.am and virulent on Rph19) and 4610P+ (virulent on Rph12 and Rph19) ruled out the involvement of these genes for the resistance observed in the CI 9214/Stirling population. Rph9, Rph12 and Rph9.am all map to the long arm of chromosome 5H (5HL). Marker-trait analysis performed in this study using 4,500 DArT markers assigned Rph9.am to chromosome 5HL in a similar region to both Rph9 and Rph12 although there were no comparable markers between genetic maps to accurately assess comparative positions. Comparative genetic analysis between the ‘Bowman’ and CI 9214/Stirling genetic maps identified six markers in common within a 15 cM region of Rph9.am and this region co-located to QTL for barley leaf rust resistance in barley on 5HL located in between 126 and 140 cM from cultivar ‘Scarlett’ . Discrepancies were observed between the order and distance of DArT markers between the parental genetic map (CI 9214/Stirling) and the consensus 'Bowman' genetic maps. This is likely to be attributed to the limited number of lines used for genetic map construction and mapping the Rph9.am phenotype. Additional file 2 gives the marker haplotype data for each closely linked DArT to Rph9.am. A small proportion of markers had missing data and this may further explain the inaccuracy of the marker order and distance observed in the CI 9214/Stirling genetic map. Bioinformatic analysis on sequence reads derived from DArT markers closely linked to Rph9.am (r 2 > 0.8) suggests that there are four likely gene candidates for the Rph9.am/Rph12/Rph9 locus within a 5 Mb gene rich region including an NB-ARC, NBS-LRR and two Serine/Threonine receptor kinases. Variation was observed between the ‘Bowman’ and ‘Morex’ genome assemblies for the physical location of two DArT markers (DART7846 and DART3079), both of which showed highest similarity to the same serine/threonine receptor kinase transcript. Such discrepancies are likely to be either due to errors in assembly between the ‘Bowman’ and ‘Morex’ genomes given their recent release or the absence of MLOC_38941 within ‘Bowman’ , which is seedling susceptible to P. hordei and lacks any of the characterised Rph genes and Rph9.am (R. F. Park, unpublished). High LD among the significant DArT-seq markers in this region, as indicated by haplotype block analysis, suggests that Rph9.am could be located to a broad region on chromosome 5HL spanning at least 5 Mb. Given the population size of the F3 families used for tests of allelism, it is possible that Rph12 and Rph9.am could be independent closely linked resistance genes separated by a very small physical distance. Bioinformatic analysis of the genes within the physical region believed to carry Rph9.am based on LD and the ‘Bowman’ consensus map suggest the presence of two NBS genes. The role of NBS-LRR genes and their involvement in race specific resistance to rusts and other plant pathogens is well documented , as is their tendency to cluster within grass genomes due to selection for duplication events in response to evolutionary pressure ,. Alternatively, there is a possibility that the same one of the serine/threonine receptor kinase genes is responsible for resistance to multiple pathotypes of P. hordei based on previously reported broad spectrum resistance conferred by both Rpg1 and Rpg5 to stem rust in barley. Both Rpg1 and Rpg5 encode serine/threonine receptor kinases and are believed to show marked homology. Rpg5 maps approximately 20 Mb away from the predicted Rph9.am locus, however, a recent study screening Australian barley cultivars with the Rpg5 marker identified only 6 out of the 14 lines postulated to carry Rph9.am also carried Rpg5 suggesting they are not the same gene . The Australian barley cultivars postulated to carry Rph9.am were all closely related based on available pedigree information. Multipathotype testing performed in this study using five P. hordei pathotypes suggests that Rph9.am is likely to be present in 14 Australian cultivars. Further pedigree analysis of all Australian cultivars postulated to carry Rph9.am demonstrated strong relatedness and shared ancestral pedigrees through ‘Gull’ and ‘Binder’, which trace the source of the Rph9.am resistance to a landrace from either Sweden or the former Czechoslovakia. Both ‘Cantala’ and ‘Stirling’ share a common pedigree in ‘Maja’ that was produced from an intercross between ‘Gull’ and ‘Binder’ . A previous study reporting on the genealogical analysis and diversity of spring barleys released from the former Czechoslovakia and the Czech Republic determined that three ancestral landraces, including ‘LV-Gotland’ , contributed significantly to feed barley cultivars. These cultivars were enriched in germplasm of more productive genotypes and were donors of biotic stress resistance at the sacrifice of malting qualities during breeding . Previous research has also found however that ‘Gull’ is susceptible to Australian P. hordei pathotypes and only carried the Rph4.d allele at the Rph4 locus. This evidence suggests that 'Binder' not 'Gull' is the more probable source of the Rph9.am resistance from ‘Cantala’. Consolidating both previous and present studies, at least three alleles contributing to leaf rust resistance [Rph9, Rph12 (Rph9.z) and Rph9.am (Rph9.am)], each with distinct race specificity, map to chromosome 5HL at potentially the same locus. Of these three alleles, Rph12 and Rph9.am appear to be most common in Australian germplasm. Genetic mapping and LD analysis in this study determined that Rph9.am is likely to be located in a physical region spanning 5 Mb on chromosome 5HL. Furthermore, this region contained three potential gene candidates which will inform future gene cloning efforts of the Rph12/Rph9.am locus for diagnostic marker development. All the supporting data in the manuscript are included as additional files. The authors would like to acknowledge the Grains and Research Development Corporation for funding this work and Mr Matthew Williams and Mrs Huda Elmansour for technical assistance. PD contributed a significant part of the phenotypic, bioinformatic and molecular genetic analysis and drafted the manuscript. MK carried part of the molecular genetic studies, DArT map construction and LD analysis and assisted in manuscript preparation. DS carried out the tests of allelism and the genetic analysis and RP characterized the gene phenotype, performed the crosses, developed the populations and conceptualized the project. All authors read and approved the final manuscript.